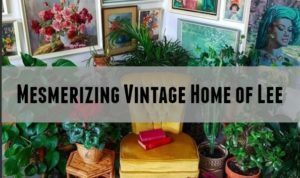 Colorful, Bold, Eclectic, Boho, Plants, Thrift Store Finds, Upcycled Decor, DIY, if these are the things that you crave in your home decor style you’re in the right place! For the past year I have been combing through the 1,000’s of home decor accounts on Instagram in search for the very best home decor accounts that center on colorful, eclectic and bold style. These accounts are bursting with color, unique style, plants, a handmade touch with upcycled pieces and DIY projects. Whether you’re searching for inspiration for your next home project or are just in need of following some truly amazing colorful home decor accounts these top 20 Instagram accounts are sure to be just what you’ve been looking for! They are in no particular order, all of them are equally amazing, be sure to click the link and follow all of them, you will love the daily inspiration you get! Kim’s account features bold, vibrant, colorful and funky eclectic DIY’s and finds from the thrift store. 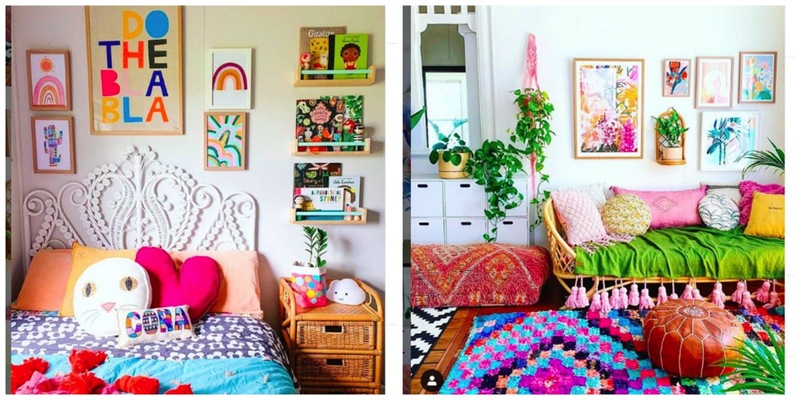 I love her Instagram account because she really pushes the envelope with the bold colors she paints her walls as well as the vibrant patterns she utilizes for pillows, bedding and rugs, it truly creates a delicious environment where there is always something new you notice even if you have seen the space before. Sarah’s account features her colorful boho home located on sugar cane plantation. Her home is jam packed with bright and cheerful pastels, lots of natural light, bold patterned fabrics and beautiful gallery walls everywhere you look. 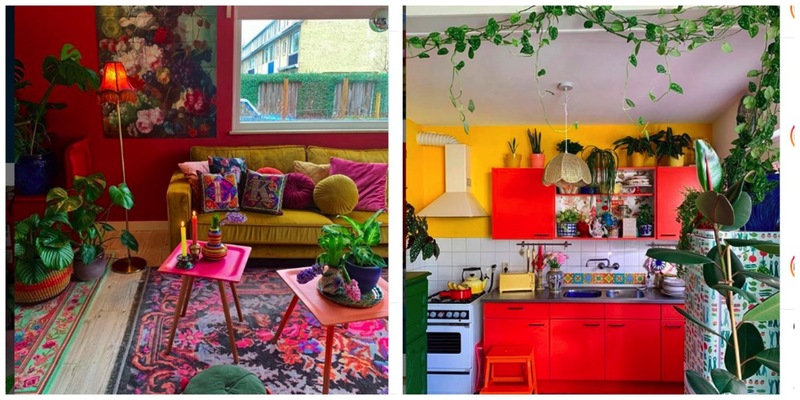 I love her Instagram account because of the bright and vibrant cheerful colors throughout her home, she does an amazing job at placing bold colors next to one another to get amazing look throughout the entire home. 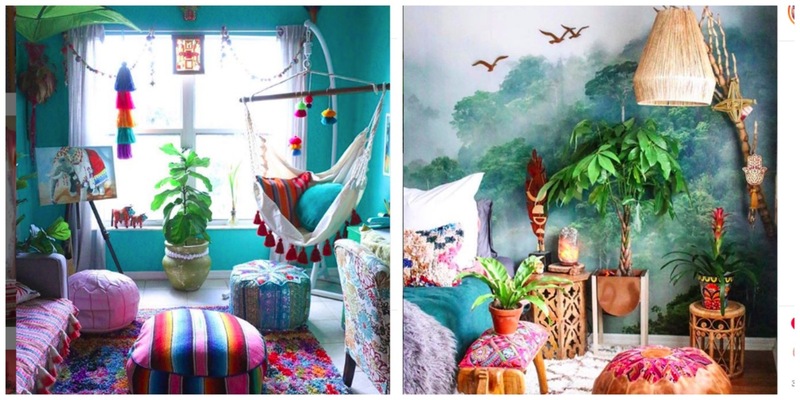 Kelli’s home is a magical tropical boho style home full of peaceful greens, blues and teals as well as lots of plants and colorful tassels, garlands and other unique pieces she finds at flea markets, estate sales and thrift stores. I lover her Instagram account because her house has a very cozy and comfy feel, and is very family oriented and loving. If you’re not yet following her be sure to, you’ll get a lot of inspiration every day from her feed! 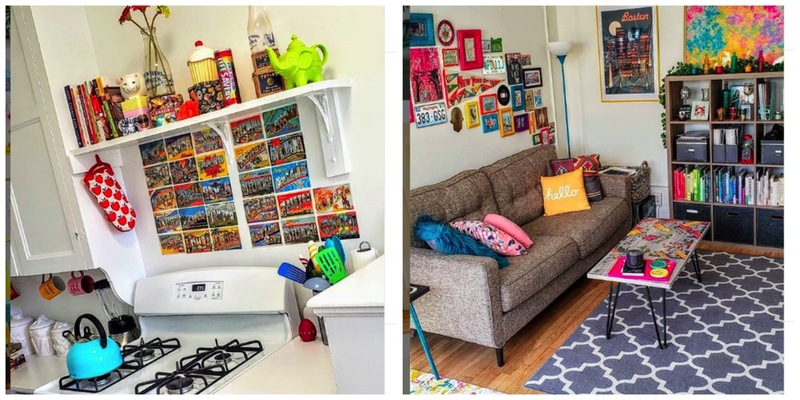 Karen’s bold colorful apartment is full of unique Ebay purchases along with DIY decor she had whipped up. I love her home because it has a very eclectic homemade crafty feel to it. She really tends to do out of the box designs in her spaces which really customize an apartment space which is often times very tricky to customize since there are only so many alterations you can do. For example she used her collection of travel postcards within her kitchen and has one of the most amazing gallery walls in her living room with a huge variety of different colored and shaped picture frames, it’s outta this world! Be sure to follow her! Geraldine’s bright colorful pastel home has a real clean look to it, and I always get a watercolor vibe from it. Her home reminds me of an early Sunday morning, it’s so calm, peaceful and reflective. She has a very clean design style that plays off of her bright white walls and allows the natural light to really make her colorful poster prints, patterned pillows and vibrant furniture to pop in very stunning ways! She has bold and colorful interior design ideas on a budget. Her home features a constant theme of bright rainbow colors along with bright and bold colored pots for her plants, vases and beautiful garlands. I love her Instagram account because she is always sharing such great inspiration when it comes to layout and placement of items on book shelves or wall shelves, she gives such great layout ideas along with color inspiration. Ariel’s bold yummy color palette and amazing eye for knick knacks and shelf design is out of this world. 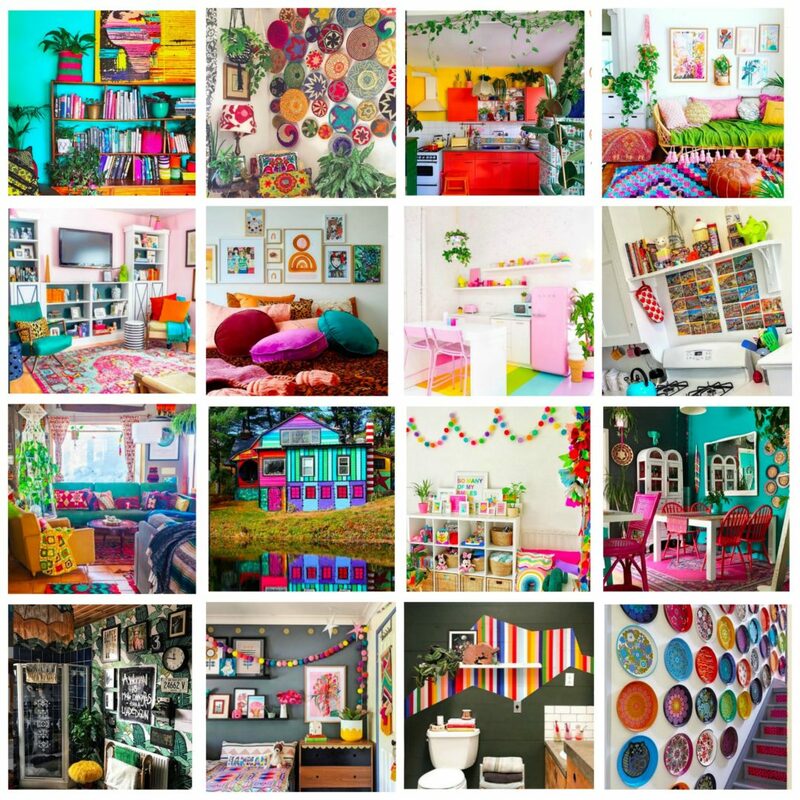 She really knows how to tie a room together like no other, it’s all about the unique, fun and colorful finds she both gathers and creates herself. It’s a lovely mix and a wonderful maximalist account that doesn’t shy away from being bold and unique, you so have to follow her account, she does lots of stories as well updating you on projects she is working on within her home. Brandi’s maximalist eclectic boho style is unique, she is also a master at utilizing space in a creative, cleaver, functional and beautiful way since she has children living in the space. I love her room layouts and small details that really make the space unique. She displays artwork on everything from shelves on the wall to pegboards which is a refreshing change from the gallery walls that are just hung directly onto the walls in a cluster, it’s nice to see something unique and fresh, be sure to follow her rad account! Rachel’s has the most amazing bold, funky and unique rooms where her main color pop is her handprinted colorful wall murals. It’s totally like nothing you’ve ever seen before, she designs these elaborate color scapes typically with stripped color bands in a variety of bold colors. No joke, her bathroom is the most amazing and fun bathroom on the planet. If you want to get some serious inspiration on how to add color pops to your home in a unique way be sure to follow her! Ms. Pink has a colorful interior full of amazing patterns and textiles. She uses the most bold and vibrant patterns within her home and has the most epic collection of colorfully designed trays going up her staircase in her home. She also has beautiful plants in her home along with fun light fixtures too, if you’re not yet following her be sure to! Chasity’s colorful boho inspired bungalow on a farm in Colorado is spectacular, it’s like a gypsy boho paradise full of colorful bedding, rugs, pillow and wall art along with tropical plants everywhere you look and vintage furniture and knick knacks it has a very unique and magical vibe and is a wonderful home to get inspired by! If you’re not yet following her be sure to, she also posts lots of fun videos on her feed sharing her farm stead with us, it’s fun to see the projects they have going on. 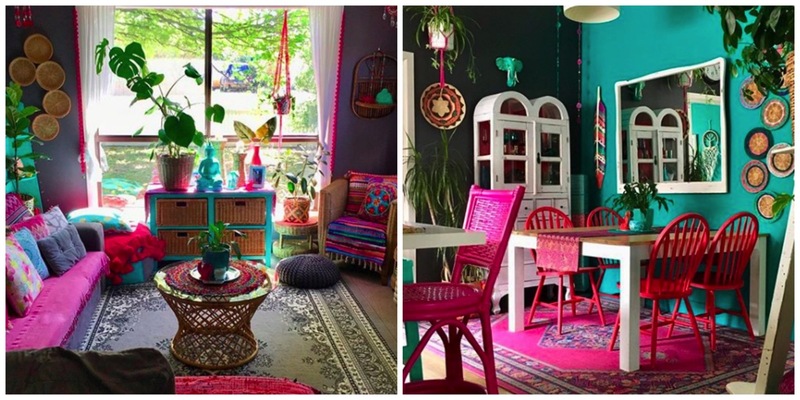 Her Instagram feed is full of beautiful pink, purple and teal shades of color with lots of plants and a boho touch. She does a lot of up cycling which makes her space unique and like no other for sure! What I really love about her home is the playful bold color pallet she has throughout the entire home along with the diversity of plants, it truly feels like a tropical oasis throughout. If you’re not yet following her be sure to! Lee’s vintage style home is full of colorful shapes, textures and patterns. She is a wiz a rearranging a gallery wall and stying shelves and tables! Her home is finely curated thrift store with the most amazing gems in it, like the day you go to the thrift store and find all of the gems in one day, her home is like that covered with gems arranged in really beautiful and unique ways, follow her for sure! Sam’s magical pastel colored vintage flair home is sure to put a smile on your face. Her home is a true reflection of her loving and bubbly personality, she has a very clean but colorful esthetic with bold vintage flair, her rooms just put a smile on your face, she has the most adorable kitchen and rainbow painted floor. She and her husband Kyle recently bought a vintage 70’s home in Austin Tx, so be sure to follow her to see the amazing styling she does with that home, it’s sure to be outta this world! Kat’s colorful New York home is nothing short of a magical dream! She makes handmade up cycled colorful sweaters and sells them full time, but I have also always admired her home and colorful style. She has a very eclectic mix of vintage decor, bold color, funky patterns and bold layout. 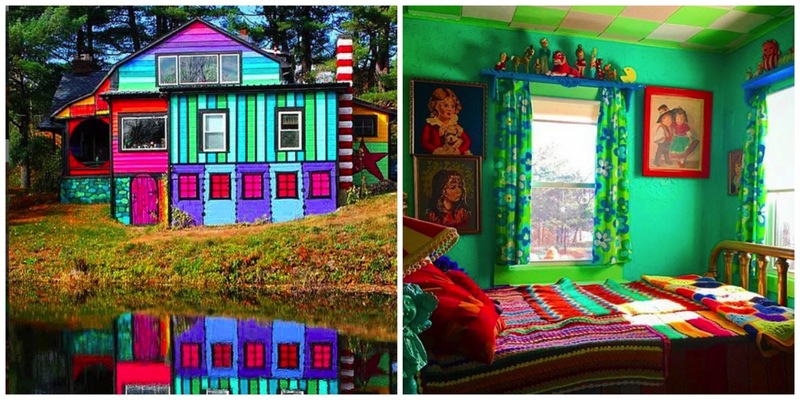 Her entire space has a very handmade feel, she even painted the outside of her home like an amazing rainbow, be sure to follow her feed for cheerful color! Nicola’a dark colorful interior is a green lovers paradise. She has beautiful green wall paper, lots of handmade and vintage items throughout the home and really wonderful gallery walls as well. What I love about her instagram account is that she features lots of other wonderful account as well that have great gallery walls and provide lots of inspirational ideas for your home decor. If you’re not yet following her be sure to! Faith’s colorful boho glam floral maximalist style home is so whimsical and full of patterns everywhere you look. Her colorful African woven basket wall is out of this world. I really love her account because she shares such great ideas and inspiration for decorating a home. 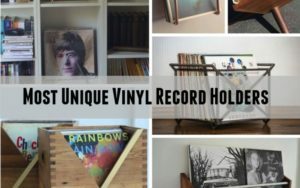 I’ve come to find how much I really enjoy accounts that have eclectic and colorful collections utilized as decor throughout their home, it really gives it a handmade unique feel when you have a collection you can keep adding to over the years, if you’re not yet following her be sure to! Rachel’s home is bursting at the seams with colorful walls and bold gallery walls. She also has some spectacular accent pieces throughout her home as well that really draw the eyes in and keep you looking around. What I really love about her gallery walls is the wide variety of different sized framing that she has as well as the variety of colored posters and art prints she has within the frames. If you’re not following her yet be sure to! Bryony’s colorful boho home has such an abundance of teals and pinks. What I really love about her account is she is another person that features lots of collection throughout her home of baskets, ceramics and more, it’s nice to use the collections for your decor because you can really be versatile with it and move things around for lots of variety and a fresh look. If you’re not yet following her be sure to you’ll be missing out! 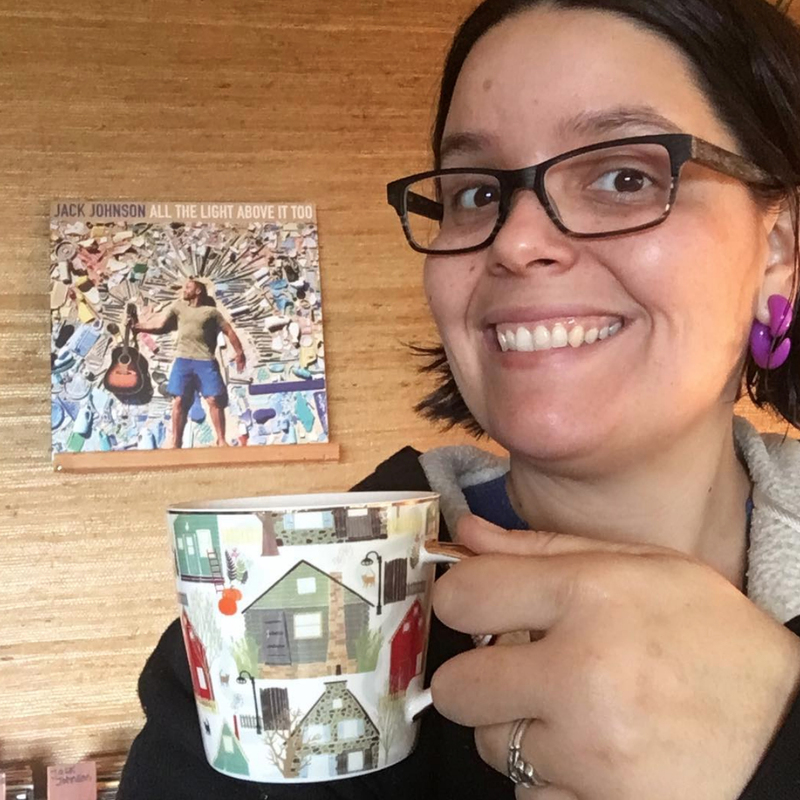 Rachel’s home is full of whimsical colorful up cycled decorations and bold colors. She uses lots of different color schemes that are drastically different for her rooms throughout her home which gives each space it’s own unique look and feel. 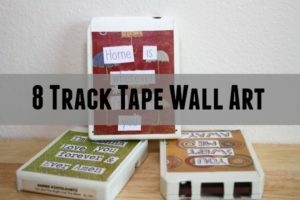 She does lots of up cycled and crafty projects that are really unique and make her home special be sure to follow her if you’re not already.